SARB’s SHOCK revelations! Billions leaving SA illicitly while NPA fails to act. Developing nations are facing a rising wave of illicit financial flows and money laundering. In South Africa the country’s Reserve Bank is at the forefront of managing the problem. Mills Soko asked South African Reserve Bank deputy governor and registrar of banks, Kuben Naidoo, to explain the scale of the challenge and what’s been done about it. What are the key highlights of how to fight money laundering? First let me just say that we don’t know how big the losses are, but South Africa must be losing billions, if not tens of billions, of rand in revenue through illicit financial flows. The South African Reserve Bank plays two particular roles in dealing with money laundering and illicit financial flows. Firstly, we assess the compliance of banks with the provisions of the Financial Intelligence Centre Act (FICA) and the relevant regulations. This is purely a compliance job to ensure that banks have the requisite systems, processes and procedures to be able to implement the act. We do this through an auditing methodology. We ask a bank for a sample of customer accounts, let’s say 70 accounts. We then go through the sample to determine whether the bank has complied with FICA’s Know Your Customer requirements. Did they check the names of their customers against the United Nations database on criminal sanctions? Did they check them against the database of politically exposed persons? If anyone was on a list, did they do an enhanced diligence? Then, we ask for all the transactions involving the 70 people and pick out suspicious transactions or those that fall within the cash threshold reporting requirements. And we check whether the bank’s systems flagged these suspicious transactions. There is then a manual process that takes up to two weeks to see if these are indeed suspicious transactions. If they are, did the bank submit a suspicious transaction report to the Financial Intelligence Centre. The second role we play involves enforcing the remaining foreign exchange controls and regulations in terms of the Currency and Exchanges Act of 1933 , a function delegated to us by the Minister of Finance. We monitor and enforce the foreign exchange aspects of cross border transactions. If a South African company or individual wants to take money out of the country above a certain threshold, they need foreign exchange control approval. Why the person violated exchange controls? If they want to declare what they’ve taken – what we call regularise? Is there a sanction we can apply? But we don’t have the ability to prosecute. We refer cases that are ready for criminal prosecution to the police who, after their own investigation, refer these to the National Prosecuting Authority for a decision whether to prosecute or not. What are the big challenges that developing countries face in terms of tracking and curbing money laundering? One of the challenges facing countries like South Africa is that it has relatively open capital markets. You can bring money in, and take money out within limits. At the same time, it also has significant amounts of corruption and crime, both of which are sources of illicit financial flows. While compliance has improved dramatically since 1994, there are still people who take a chance by avoiding taxes. The challenges therefore are: the corruption; proceeds of crime; and the legitimate South African businessmen who wants to avoid taxes. What are countries like South Africa getting right? The Financial Intelligence Centre – which is housed in the National Treasury – is a significant tool for monitoring the financial sector. But it’s limited to monitoring the formal financial sector. It also has a strong bias towards electronic transactions. In general, the financial sector has a high level of compliance with the Financial Intelligence Centre Act. The act, and recent amendments, give the Reserve Bank significant powers to monitor transactions and require banks to report suspicious transactions. The legislative framework also creates room for greater cooperation among the three institutions – South African Revenue Service, the South African Reserve Bank and the Financial Intelligence Centre – to connect the dots and pick up patterns regarding money laundering, tax evasion, or fraud. Where are the big gaps? The financial reporting system that the South African Reserve Bank monitors is almost unique in the world. The bank has records of every ATM, debit card, credit card, or electronic funds transfer (EFT) transaction, whether done in South Africa or abroad. If a South African uses their card to buy coffee at Starbucks in New York the bank knows. The system provides the bank with an opportunity for further investigation if it picks out what it believes are patterns of money laundering. But there are gaps. For example, South Africa’s remittance system allows transactions worth R3 000 per transaction, or R10 000 per month. There are almost no questions asked, only proof of identity. And there’s evidence that the remittances system is being abused. Then there are gaps relating to South Africa’s trade with the rest of the world. For example, we have a 40% duty on imported clothing. You bring in a container load of shirts and tell the South African Revenue Service these shirts cost R10 each, and you pay R4 in import duties per shirt, but actually the shirts cost R100 each. You now have to get R90 out of the country illegally to pay for the shirts. What you do is you send lots of gifts to somebody abroad. Alternatively, you set up a company and you apply for an advance purchase authority to pay for the imports. Once the payment goes through, but before the goods are delivered, the company collapses. Or you say you are importing software for R50 million and you transfer R50 million and the exporter sends to South Africa a box of compact disks (CDs). Our customs officials have no way of knowing whether these CDs are worth R5 or R50 million. For all you know, they could be copies of Lionel Richie’s CDs. 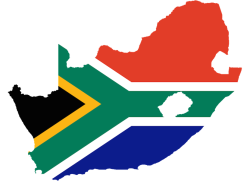 Even though the legislative framework provides for cooperation, there is often not good cooperation between South African Revenue Service, the South African Reserve Bank and the Financial Intelligence Centre. The last gap relates to law enforcement. We have given 151 cases to the police and/or the National Prosecuting Authority over the last 5 years, out of which there have been only two prosecutions. This might be because they don’t have the time, resources, expertise, skills, or the will to prosecute. 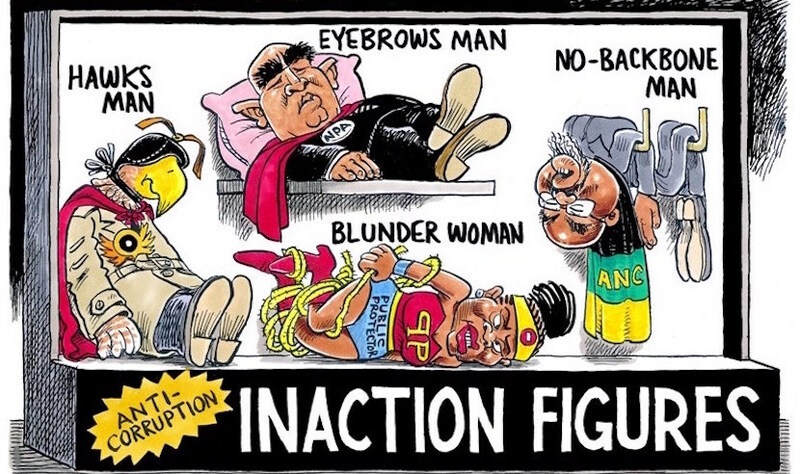 Anti-corruption inaction figures. More of Zapiro’s brilliant work available at www.zapiro.com. How can the gaps be closed? This can be achieved through tighter cooperation between relevant institutions. And by creating better capacity to prosecute money laundering and illicit financial flows. This is part of a series called Face-to-face interviews The Conversation Africa is running in which leading academics put questions to prominent individuals in the public, private and not for profit sectors. Mills Soko, Associate Professor, Graduate School of Business, University of Cape Town. This article was originally published on The Conversation. Read the original article.